My Victory Box August 2017 included a tie, a pocket square, and a money clip. See my review of this men’s accessories subscription + coupon code! 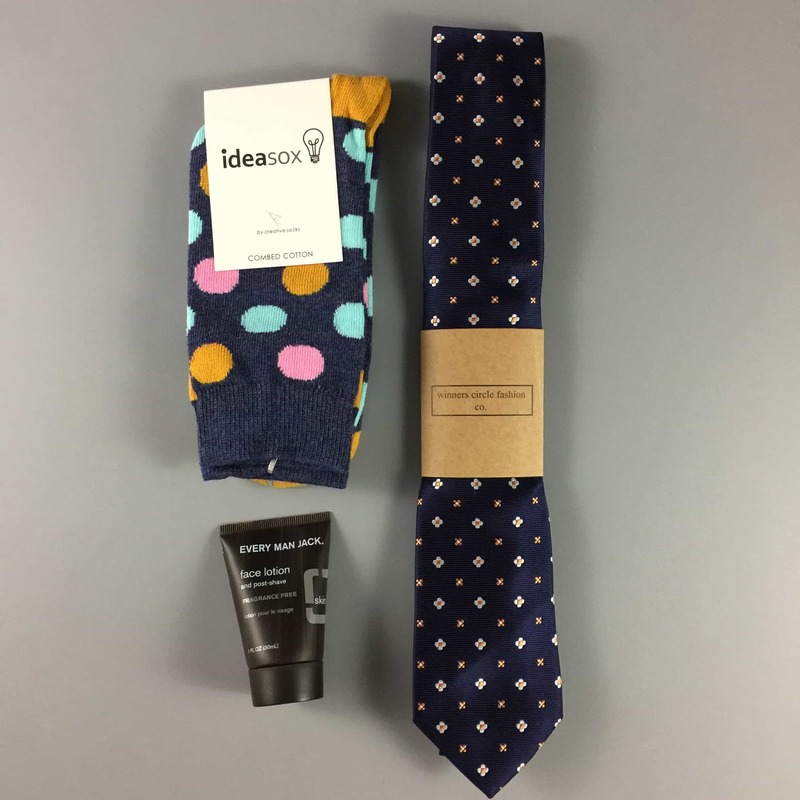 My Victory Box July 2017 included a tie, a pair of socks, and a face lotion. Check out the review and grab coupon code to save $5 on your first box! A tie, a pocket square + more men’s accessories! Check out my June 2017 review of Victory Box and grab coupon code to save $5 on your first box! Victory Box is a men’s accessories subscription. Check out the contents of my May 2017 box! Here’s the review + coupon code to save $5 on your first box! Matching tie and accessories! Check out my Victory Box April 2017 review + coupon code to save $5 on your first box! See the Victory Box March 2017 coordinated ensemble – here’s the review + coupon code to save $5 on your first box! Check out the coordinated ensemble we received from Victory Box February 2017 – here’s the review! Victory Box January 2017 came with matching items: tie, pocket square, cuff links, and an extra goodie. Check out our review + coupon code! See our November 2016 review of Victory Box, a monthly men’s subscription box with items from Winner’s Circle. Use coupon code to get $5 off your first box! Stay dapper with Victory Box, a monthly men’s subscription box featuring items from Winner’s Circle. See our November 2016 review + coupon! Stay dapper with Victory Box, a monthly men’s subscription box featurin items from Winner’s Circle. See our October 2016 review + coupon! See our review of the August 2016 Victory Box, a monthly subscription box for men from Winner’s Circle! See my August 2016 Victory Box review – a tie and pocket square monthly subscription box! See our review of the July 2016 Victory Box, a monthly subscription box for men from Winner’s Circle!